I think that is an accurate assessment, and as such, this new book of mine was a work of passion. While outside my usual genre, I absolutely loved the process and the stories; I hope you will too. Just a few generations ago, Northwest Florida was one of the most challenging frontiers in the whole United States. Still, the settlers came, as the bounty and potential of the Panhandle were far too alluring. Yet, in every paradise there are fallen angels, and Florida’s backwoods had its fair share of those. Post-Civil War, these bayous and timberlands became a haven for moonshiners, outlaws, and bandits as mean and wretched as any desperado of the American West. Walton County, the absolute heart of the Florida Panhandle, may have been the wildest community of all. Inspired by the 2015 “Grit & Grace” production by the same name, Wild, Wild Walton is Ronnie McBrayer’s exploration of pioneer justice in Florida’s Panhandle. 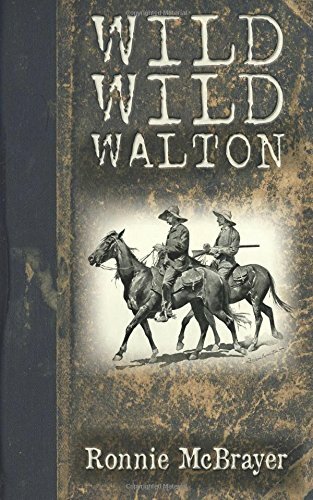 Combining the elements of historical fact, oral storytelling, and narration, this is an exceptional look at the good guys and gangsters, the posses and picaroons, the devils and deputies who shaped Walton County’s past – and who continue to forge its future.